I seem to be catching up on a few of those writers I've inadvertently not got round to reading. Latest is Ursula Le Guin. Not her classic "Left Hand of Darkness" of the Earthsea books, but her 1971 novel "The Lathe of Heaven." George Orr is in a bad way having taken too many drugs to stop him from dreaming. He has to be referred to a psychiatrist to wean him off his addiction. The world he lives in - an overpopulated American western seaboard, a Portland, Oregon where it always rains as climate change and man-made pollution have led to the desert inland also being repopluated - is a chaotic, controlled one, where food is rationed to keep up with the over population and drugs are used to subdue them, but are equally rationed. He has a good reason for not wanting to dream - for the dream's that he has come true, more than that, they change the past to enable this rewriting of history. He can't control this, and so has been taking a cocktail of drugs to knock him out but suppress his dreams. The psychiatrist he is referred to has a special interest in dreams. William Haber has been developed a machine that through hypnosis can speed up, control and record the dream state. He begins to put Orr into a trance and asks him to dream of "a horse." The picture on his wall, on waking, becomes the horse of the dream and its as if the previous mountain picture has never been there. Yet such innocent changes don't last for long. These controlling dreams grow in dimension. The past changes and because the road to the present has so many variables those also change. It's a fascinating re-take on the idea of time being changeable. For in Le Guin's book, there is no time travel, just a rewriting of alternate histories. The psychoactive drugs of the sixties feed into a lot of the SF of the period, writers like Blish, Harrison and Le Guin. Haber appears not to realise what has happened, yet Orr is not so sure, and begins to suspect he is being manipulated. The doctor gets more successful, the dream worlds that Orr creates becoming the new reality. Despite this, certain things stay the same: the world is always at war; the president remains the same. For his part Haber is wanting to improve things - what harm can it do if it rains a little less for instance? When Orr approaches a lawyer because of his concern, she agrees to come and "observe" the next hypnosis session ostensibly to check out the legality of Haber's experimental Augmentor machine. Haber is vague on what he asks Orr to make happen - Orr has been agitated at the overpopulation of the world - and in the next dream the world changes cataclysmically, a giant plague wiping out 4/5ths of the planet. For though his dreams can be directed they cannot be controlled. In this new underpopulated world everyone has enough food, larger flats, is healthy - but they also have memories of the plague that has wiped out so many. Yet the war goes on. Haber asks Orr to create peace amongst men - and it happens but in the dream the corollary that allows this is an alien invasion which sees the moon taken over by Orr's imagined aliens and cause mankind to join together to fight the new enemy. Heather Lelache, the mixed race lawyer who has been helping Orr is intrigued by him - and when she realises he has disappeared she travels off to the remote shack where she suspects he is hiding. Whilst there the connection between them grows but she also agrees to hypnotise him to change Haber into someone who helps Orr. She also foolishly asks that he gets the aliens off the moon - and off they come, to invade earth. The upping of the ante- throughout the novel is its real strength, even though we never once have a reason for why Orr has this particular power. But in Haber's exploiting of it, we are taken from one precipice to another. With the alternate realities beginning to contradict each other, the novel becomes more fractured in its final third as Haber tries to take over Orr's power so he can now dream the dream's himself. Yet this causes a chaos that sees the world in total crisis. There is no going back, but bits of the old world can be returned to - and besides the world as it was originally meant to be was going to end in atomic collapse at some point. It's a tour de force in many ways, a long story that just about keeps its internal logic working throughout. 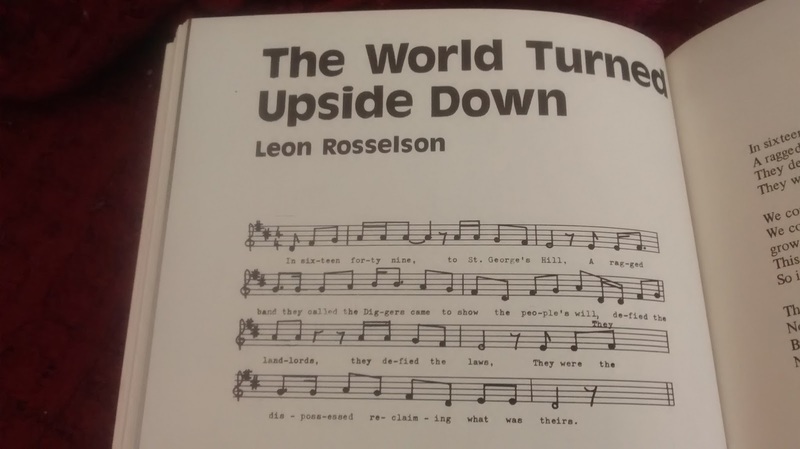 The title comes from a misquote from Confucious and the book is highly philosophical in how it uses this dreaming of alternative futures to suggest the moral quandary inherent in trying to make the world a better place. I'm minded of a few conferences I've been to recently where a certain social determinist mindset is in place as new technology and big data are seen as being cure-alls, with only positive consequences. I think some of the alternate futures in Stephen King's recent JFK novel follow something of the same internal logic of Le Guin in the Lathe of Heaven - or the problem of unintended consequence. Part of its skill I think it that there's just enough confident technical detail to believe in this channelling of the dream state - and so the ramping up of the consequences, when they come, are built on a solid foundation. The aliens in particular are a fascinating touch, because they can only be from Orr's imagination, so that their uncertain communication comes from him only having half imagined them - they exist, if at all, partly in dreams. Apparently there have been a couple of ill-advised film adaptions of the novel - its hard to see how they could work - as the dream states and the alternate realities are so much of the imagination. An excellent novel and great introduction to her work. Fireweed Magazine was published in Lancaster in the mid-1970s, with the subtitle of "working class and socialist arts" and edited by David Craig and Nigel Gray. Craig, presumably being the same Craig who is now Emeritus Professor of Creative Writing at Lancaster University and ran the solitary creative writing unit when I studied there in 1985. I was fascinated to pick up issue 3 of the magazine - Autumn 1975 - from Oxfam recently. 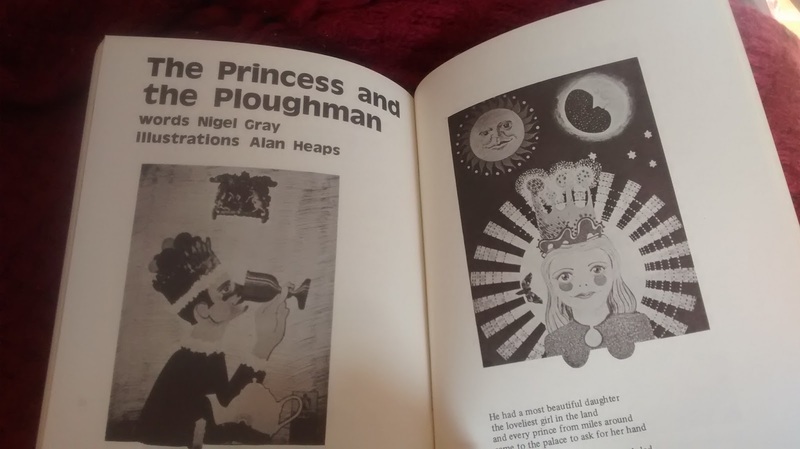 A kind librarian at Lancaster University tells me that the complete run of 12 issues is in the library at the Universities of Manchester and Leeds, and if I ever get the opportunity, I'll have to go and seek it out. I'm happy enough with issue 3 however, as it seems a microcosm of a literary world that doesn't really exist in the same way any more. One of the abiding memories of Jeremy Corbyn's first few days at Labour leader was that when presenting about culture he dutifully said all the right things, but you had the sense that here was a man who had spent most of his life preferring political meetings over cultural events. Culture, for a certain part of the left, is seen as somehow elitist. 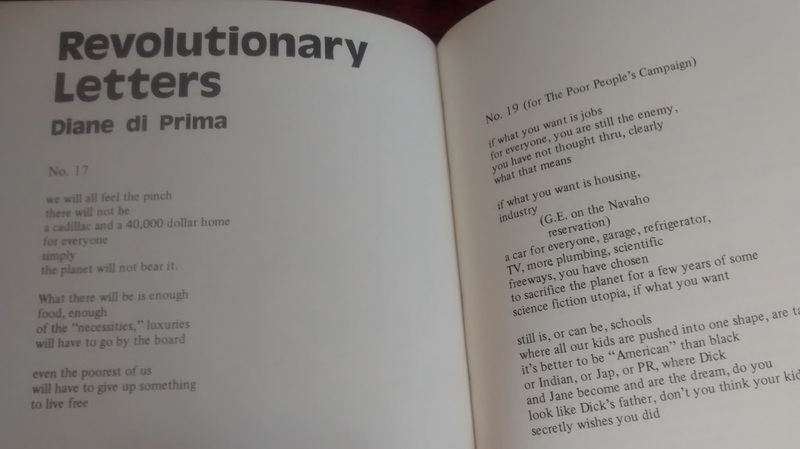 I was at an anarchist book fair last year just after I'd had a story in Black and Blue's "Revolution" issue and I was struck how the busy room had no room for culture. Even ten years ago I think there'd have been poetry and music at such an event. 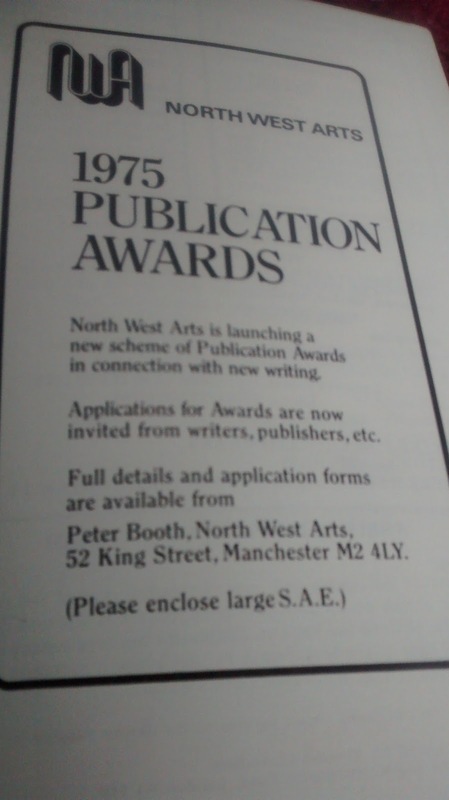 Longer ago than that, as Fireweed indicates, there was something that could be called "working class and socialist arts" - moreover, it wasn't parochial but international in scope. 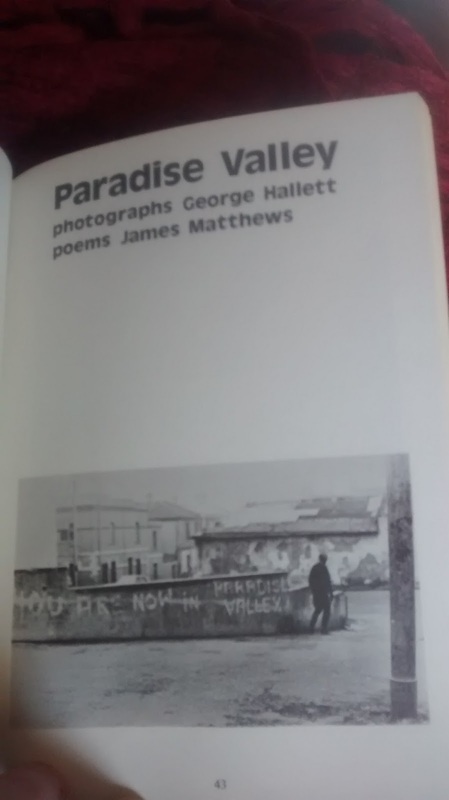 In this issue alone there are photographs and poems from George Hallett and James Matthews focusing on the black South African townships; there are poems from the City Lights published poet Diane Di Prima. Previous and future issues mention Brecht, Neruda and Vonnegut. The biographies at the back include some gems: "Archie Hill is a blackcountryman", "Nigel Gray...an ex-manual worker", "Frances McNeil is an ex-Ruskin student". 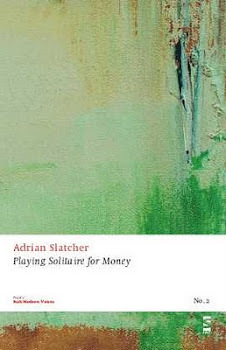 Its a far cry from contemporary biographies of "studied creative writing at....". Even at this distance there are some names that haven't faded into obscurity. Edward Bond has a short story here. He is best known as a playwright. Leon Rosselson was a singer-songwriter, well known on the folk scene. Best of all is the mix of words and images. 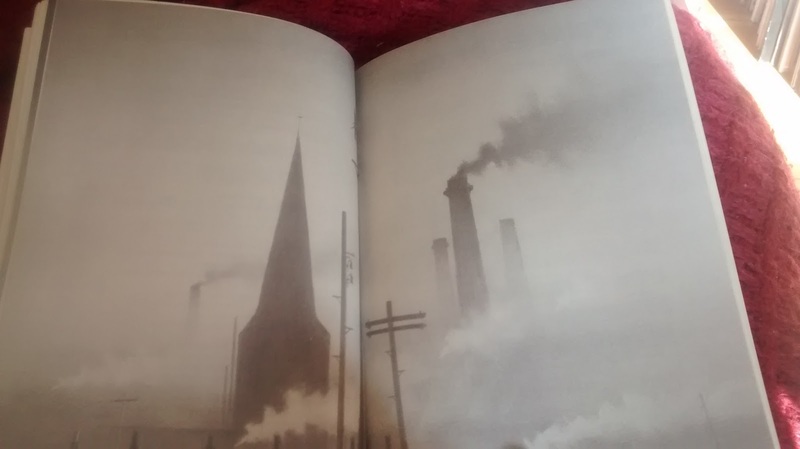 Smokestack photographs to accompany the two Rosselson songs (with music as well as lyrics provided), collages by Alan Heaps to accompany Nigel Gray's fairy story, and of course the striking photographs of the South African townships. 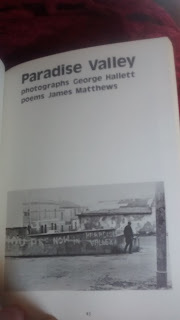 The young naked boy on the cover seems incongruous, an apparently rural image of poverty when Hallett's other photographs are all urban. 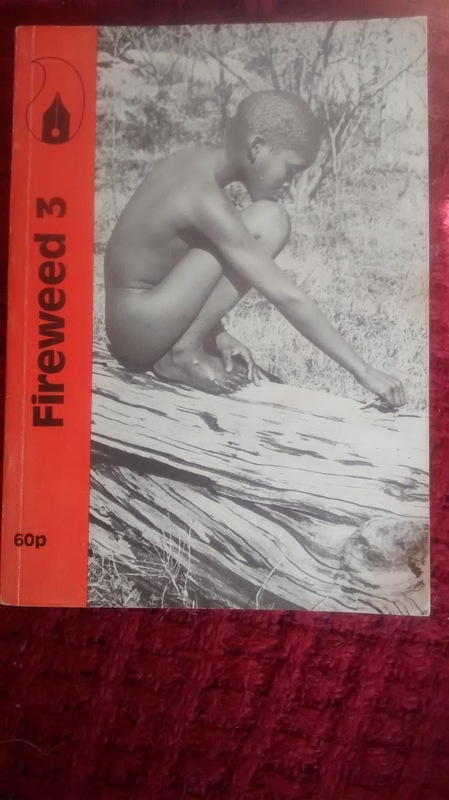 Some things don't change of course - there are few women in these pages - and interestingly an internet search discovers another "Fireweed" magazine - a feminist Canadian magazine from the 1980s. Coming from a period a long time before the internet this is a forgotten magazine - it was a new title to me - but a fascinating one. I'd love to know a bit more. The content is a varied mix that lives up to its subtitle. Surprisingly, perhaps, its all creative work with only a few adverts at the back referencing cultural studies and the like. And of course though we don't call things "working class and socialist arts" anymore the spirit can live on. A new Manchester magazine called Beatification, edited by John G. Hall, Neil Campbell and Steven Waling is looking for subscribers/running a crowdfunding campaign. I always wanted to be a novelist. It remains, to me, the supreme art. "Novel" as in unusual, however far from that ideal so many generic books have become. "You can lose yourself in a novel" the cliche goes and it's true: though what does that really mean? Are we lost in the labyrinth? Rather, the phrase means, lost to the novel, in the same way that you can be lost to a piece of music, or to a lover - you are no longer yourself, the novel has changed you. In reality, of course, this muse, this unknowable paper-being is a tease to us because it can't be paraphrased. You have to read the damn thing, all those pages. "Infinite Jest" or "Ulysses" are swamps in which you can get stuck, genuinely stuck, without a compass, having to read on to see a parting in the trees and a glimpse of a star which can guide you out of the word thicket. Even a short novel, a "Gatsby", a "Breakfast at Tiffany" needs this engagement, and being short, you might just be tempted to start again, knowing the end, in order to concentrate on the words and how they make you feel. Yet how do you write one of these things if that's what you aspire to? So many words. I can pretty much say that my whole writing life has been a bit of a quest to find out what kind of writer I am. A long time ago now, starting an M.A. in novel writing, I had my doubts, but I also felt that it was long form fiction that was where I wanted to be. 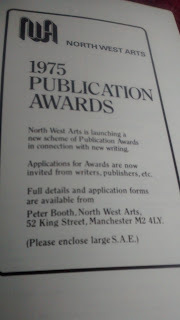 It's now a dozen years or more since I finished a novel, but I'll come back to that later; whereas you can be a poet based on a smattering of poetry each year, can you be a novelist when you haven't written a novel? A few "Best British novelists" - Helen Simpson for instance - haven't yet published a novel for instance; yet the term "prose writer" or "short story writer" sounds an awkward one. If I respond to the name "poet" its because its easier, yet its no more accurate than "novelist" even though I've not had a novel published. For novels are places where even the writer of them can get lost. Sometimes abandoning the book that you started with such hope. It's a marathon not a sprint (hence this blog title, cribbed from Alan Sillitoe's long story...novella....novel). I look back with amusement on my novel writing plans - there were so many ideas, some didn't get much further than a title and a paragraph. There was "The Westerlys" which began, "like their name they blew in from the coast, and during their short time in our community they changed it." I still want to read that "novel" that never progressed beyond a first paragraph. Then there was "Sleeping Next to God", a turn of the millennium noir about a man who had desperate dreams that meant that whoever he slept with ended up dead. I finished the first part, but it got derailed about 1997, and the millennium has come and gone. Back around the time I did my M.A. it was which of these novels I would continue, which I would write. The one I eventually wrote, a contemporary story set in London beginning on the night that Tony Blair was elected Prime Minister, took its setting from my previous year when I'd briefly lived in the capital. It talked about YBAs (before they were famous) and dot com companies (that were yet to form.) The writer of contemporary fiction comes with a sell-by date. The novel is a lot of words, and it takes a lot of time. I benefitted from having a peer group and I'm benefiting now from being part of a small writing group, three of the five of us having already published novels. So its less lonely than it was, yet as the "work in progress" grew from a long story to a novella, to a full length novel with a title, a structure, a format, I realise that the peer group is there for some kind of validation, for the novel progresses in fits and starts. Whereas one friend will reorder her work several times from the version we've seen, I know my structure once it's in place will stay as it is, but the bits that need colouring in - or pulling out - are complicated and intricate. There's some strange magic takes place where the various pieces fall together, and not being one to do more than a rudimentary timeline or plot summary I realise that what I'm now struggling with is not the mechanical aspects of the novel, but the visionary ones. One of those other novels I wrote, over a dozen years ago, took place in a single day, and I wanted it to have some of the mysterious nature of Saramago's "Blindness" or Ishiguro's "The Unconsoled", yet I realised as I wrote the more action-based finale that I'd somehow lost this to the prosaic nature of plot and denouement. I could unpick story, but I realised I couldn't unpick the language and tone of the novel. That one was written quickly - in 3 months - but this one I'm working on now is 2+ years and counting. I can see the end, but I haven't yet written the end and though I know the scenes I've been struggling to fit them together like I've sentences without conjunctions. Really, I know that I've been slowing down as I try and recall the essence of this book, its particular flavour, and that's something - like a complex soup or curry - where though you can follow the recipe, and use your experience, you can only really taste in the making of it. So I think that's what is so ineffable about writing a novel, or the kind of novel I'm now trying to write. I'd love to say I'll just write the story, but stories can be inert if they don't have some animating fire underneath them all. I need my automatons to have the simulation of life, even if like the replicants in "Blade Runner" they have a cut off point, a manufactured end date. How to describe the unknown to someone? A singer can demo a song and work with the band and producer to bring it alive, yet even if I had an agent or publisher I think their role would be merely technical. The strangeness of the novel - the thing I'm trying to do with it - is as hard to articulate as speaking about a particular artistic effect. Magnus Mills tells of how he'd not got the ending for "The Restraint of Beasts" and then it came to him all at once. There's alchemy in novel writing - in a way that I'm not so sure is quite there in short story writing, where the craft aspect is about honing something small which can be visioned, which can be encapsulated. And this book, which I began because I wanted to write a longer work, and one that I felt I could get to the end of, and which - at the time - I thought was fluid enough to enable it to keep my interest; grew about 15,000 words in into something else, and I knew it was a novel. In some ways its not the "story I absolutely have to tell" but I do think its the book I have to write. I'm not in it, for a start, no "I am" narrator, and none of the characters who resembles me beyond the basics of gender and age. So I'm getting to know these characters even at the same time as I'm bringing them to life. I'd forgotten what a fascinating process that could be. In a story the characters seem fully formed somehow, because they only exist within that story's smaller temporal space, but in the novel, I need to know more... I need to project back on their lives, and root them in back story. More than that if there is magic in the novel - in this novel - it is a magic that dare not speak its name. I've always been a writer willing to explain what I'm doing, but perhaps the years of writing poetry and shorter fiction has made me more reluctant to look into the eye of the storm. I think the book works - or has to work - on its own terms, and here I'm returning to the forgotten selfishness that you need as a writer, that desire to please not a crowd, not even yourself, but the monster you are bringing forth from the clay. No wonder "Frankenstein" is such an archetype for writers, given its mysterious bringing to life, for that's what we always do whether its Huckleberry Finn, Harry Potter, or Dickie Greenleaf. I'm writing this when I should be going back to the novel - I can hear it's breath, I can see it's form, but still it is not quite alive, it still needs the unplugging from its life support to be able to live by itself that only comes when I type the words "THE END".